“An ounce of prevention is worth a pound of cure.” True. We cannot prevent snow and freezing rain from falling on roadways, but we can prevent the worst consequences: denial of road serviceability and safe driving conditions. In snow fighting, prevention means anti-icing. 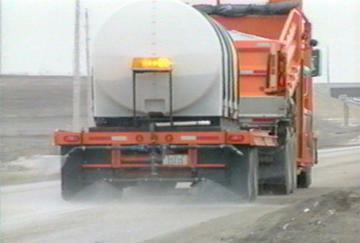 Anti-icing measures take place before snow falls and ice forms on the roadway. They aim to prevent the bond of frozen precipitation to the road surface. In some circumstances, anti-icing can dramatically cut the cost of maintaining a safe road surface over conventional de-icing. Anti-icing chemicals are applied in liquid form (brine) to road surfaces just before a snow or ice storm. Liquid sodium chloride (NaCl) is the most effective choice for anti-icing above 15° F (-9.4° C). The roadway surface is never "lost." Snow fighters respond pro-actively. Anti-icing returns road surfaces to normal faster, resulting in fewer accidents and delays. Anti-icing measures take place before snow falls and ice forms on the roadway and aim to prevent the bond of frozen precipitation to the road surface. In some circumstances, anti-icing can dramatically cut the cost of maintaining a safe road surface over conventional de-icing. Anti-icing chemicals are applied in liquid form (brine) to road surfaces just before a snow or ice storm. Liquid sodium chloride (NaCl) is the most effective choice for anti-icing above 15° F (-9.4° C). Using a liquid ice-melter jump-starts the melting process because salt needs moisture to be effective, and only in freezing rain would an anti-icing application not be either pre-wet or an entirely liquid application. Brine doesn't bounce or blow off the road surface, so material is used more efficiently. If the storm is delayed, salt residue remains on the road ready to begin work when precipitation begins. Crews can cover more territory by beginning treatment in advance of a storm. Increased efficiency results in use of less salt, minimizing environmental concerns. Anti-icing products available include sodium chloride, calcium chloride, magnesium chloride, potassium acetate and calcium magnesium acetate. Each product has its own advantages and disadvantages. The most common material in use is sodium chloride (salt), brine made from a mixture of rock salt and water. Salt brine is effective to –6° F (-21.1–6° C) and is a proven anti-icing agent in use throughout the snowbelt. Some agencies use calcium or magnesium chloride in a brine solution which is effective at lower temperatures, but is more than six times more expensive than salt and more difficult to handle. Also, calcium and magnesium chloride residue on road surfaces can attract moisture at lower relative humidity than salt, which may result in dangerous, slippery conditions under certain circumstances. Returning to bare pavement conditions more quickly, saving lives and reducing property damage due to fewer accidents, as well as the reduction of traffic delays and avoiding the resulting reduction of losses to local economies. Reduction in the quantity of de-icer used, resulting in cost savings and less environmental concerns. Reduction in the manpower necessary to maintain safe road conditions, resulting in less overtime costs, less operator fatigue and safer working conditions.